Now days if we see the latest websites where use need not to register to the website and directly access the contents by using their Social Websites credentials like we can use Facebook credential, Twitter credential, Google credentials to enter to the new websites. While login with our Social website credentials, all the information related to our logic will be directly added to the new website so that next time onwards, we can directly enter our login credentials to the new website to access. All the details of our logic will be saved in the new website when we provide the access to get the details from our Social networking site. It helps us in that way that we need not to fill our all details for the registration for the new website and all the details will be directly copied from the Social networking site to this new site. Question: Why do we need to add Social Networking Login links to our websites? Social Networking is very popular now a days and most of the people are having their accounts in the Social Networking sites. So if we provide this feature that they can just login from their already existing account (social networking sites account), it will be easy for them to login and we can get the details from those sites and save in to our site. The user doesn't need to fill the lengthy details as the registration form and then validate the emailed, phone number etc. 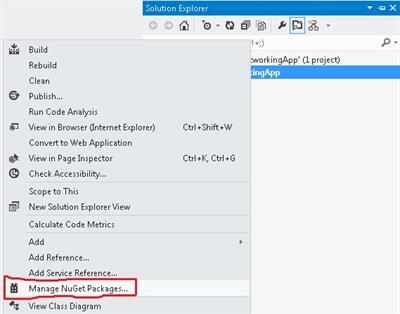 Step #1:Open Visual Studio 2012 IDE and go to File -> New -> Project, Choose ASP.Net MVC 4 Web Application. 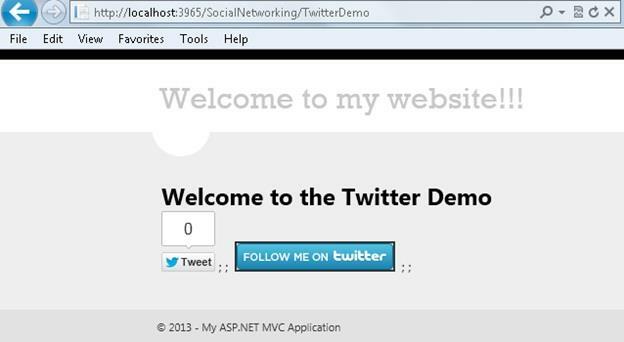 Provide the name as "MvcSocialNetworkingApp" and Press OK. Install the library by clicking the install button. This library is used to get the helpers for the View contents. 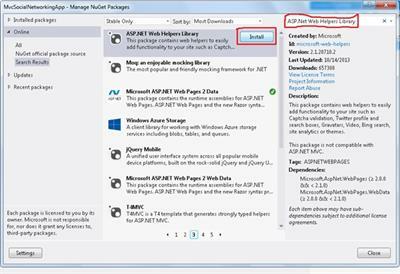 Step#5: Installation is the series of steps which needs to be performed by the user by accept and next steps. Once the installation will complete, close the window. 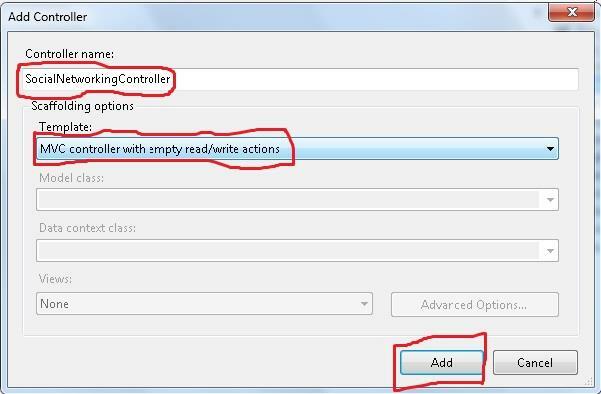 •	Here we need to choose the scaffolding option as- ‘Mvc Controller with Empty Read/Write actions’. Step #7:Automatically all the actions(CRUD operations) for these operations will be generated. Step #8:Remove the unnecessary actions which are not required and add out own Action methods. 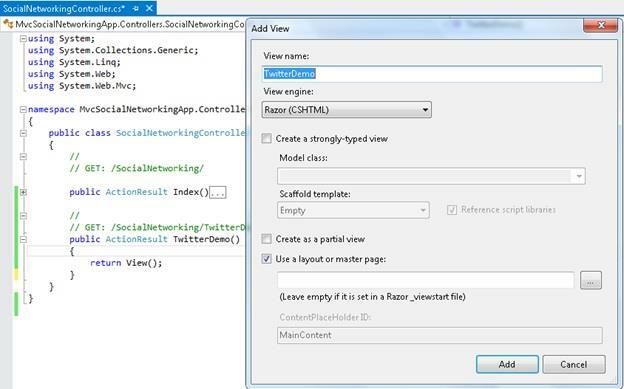 Step#8: Go to the TwitterDemo action method of the controller and right click inside the action method and click on ‘Add View’. It will generate the empty ‘TwitterDemo’ view. 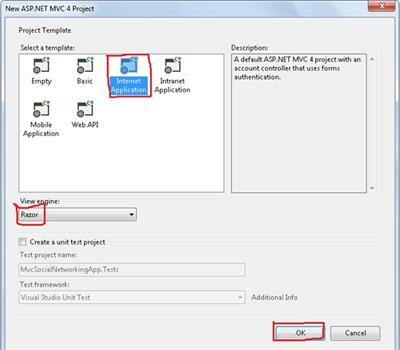 Step#12: Run the application and call the controller and action method to check the Facebook demo. Step#15:Nowhere the user can use their social networking accounts to login to my application and all the data will be retrieved from my social networking website. Click on Facebook and enter the user name and password of the Facebook and it will be used to login to your website. 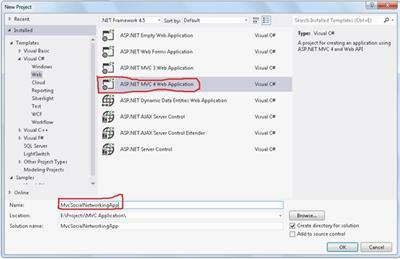 Hope this article will make you to understand that how the ASP.Net MVC4 is integrated with the Social networking websites.